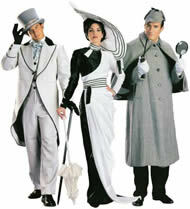 Rental Costume includes: A grey suit consisting of jacket, pants and vest front with velvet trimmed collar and piping. The ensemble also includes an essex collared shirt, ascot and top hat. (Note: This rental costume does not come with the gloves and walking stick as shown in the photo.). Rental Costume includes: A historical dress of the period made in black and white with a pleated over skirt. A cummerbund and hat are included. Rental Costume includes: An Inverness caped coat and matching deerstalker hat in tweed. (Note: The rental of this costume does not include the trousers, gloves, pipe and magnifying glass shown in the photo. ).